Can you work out what's on the editor's desk? Returning once again, your favourite technology magazine and website T3 will tomorrow be giving you the chance to win a feast of mystery tech prizes in our weekly competition 'What's on the editor's desk?'. 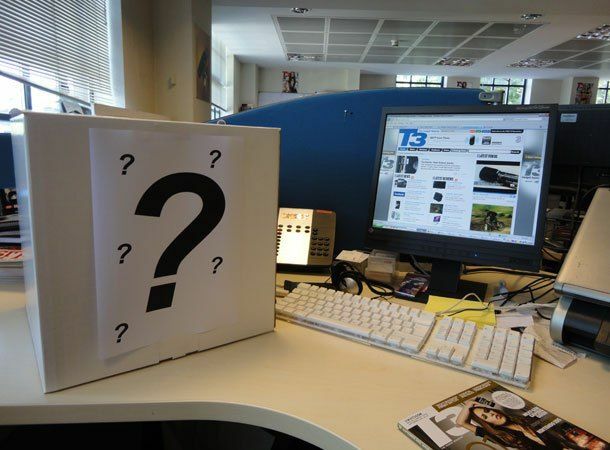 Running across the T3 Facebook and Twitter pages we will be presenting you, the loyal T3 readers with three riddled clues to see if you can guess 'What's on the editor's desk' and claim yourself some tasty tech treats. From handsets to headphones, games to general gadgetry, each and every Tuesday we will be giving it all away as long as you can solve the puzzle and work out what's in our mystery box. Kicking off with the opening clue at 10am sharp you will be able to pit your wits against the T3 riddlers and bag yourself some booty. The second clue will followaround 11am before the final hint lands on our social streams at midday. From there you will have until 3pm to get your answers in before we pick the lucky winner. Entries can be made by either commenting on the Facebook post or by messaging us on Twitter @T3dotcom with the hashtag #edsdesk. A winner will be picked at random from all the correct answers and if no correct answers are received by the 3pm closingthe week's prize will be rolled over until the next edition of 'What's on the editor's desk'. To be in with a chance of winning today's great and exclusive prize, sign up to the T3 Twitter and Facebook feeds today so you are primed and ready to follow the clues to the T3 treasure tomorrow.